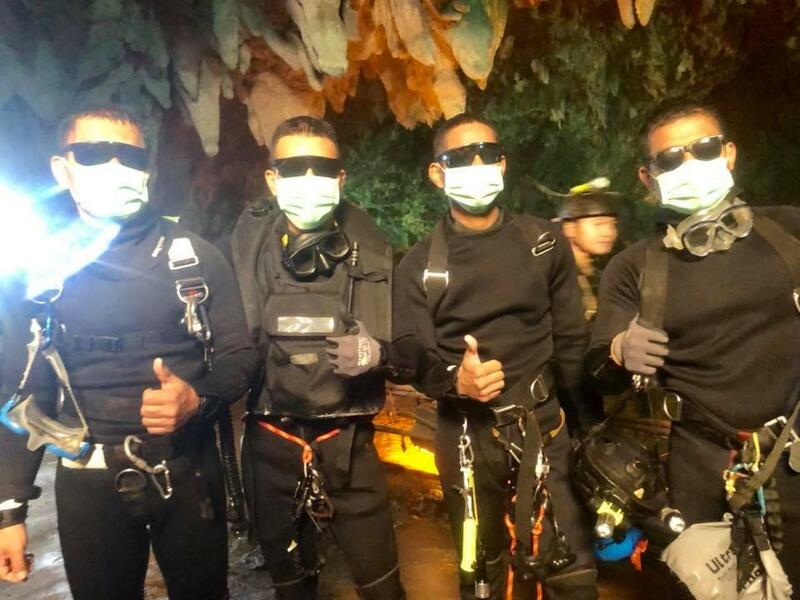 The Thai Navy SEALs shared a photo of four brave men who stayed with the soccer team trapped inside a cave as the world celebrated their successful rescue mission. The photo shows four SEALs in sunglasses and masks, with their gear hanging from their bodies, giving a thumbs up. The photo appears to have been taken inside the cave or near its entrance. The leader of the rescue operation said on Tuesday that all of the SEALs are now out, just like all 12 boys and their coach. "Hooyah Hooyah Hooyah," the Thai Navy SEALs wrote as the photo's caption on Facebook. The SEALs often use the word "hooyah" in Facebook posts when expressing excitement and celebration. It also appeared numerous times when they gave updates on the cave rescue, which was carried out over three nerve-wracking days. "All four SEALs came out safely," they wrote with the photo, which was shared nearly 80,000 times in two hours. Rescue teams traveled into the darkness nearly 10 days ago and found the boys and their coach trapped after heavy rains flooded the cave. It took a total of 90 divers and support from experts from around the world to get the whole team out safely. The SEALs in the photo, as well as a medic, are being praised for staying with the boys and ensuring every last one exited the cave before they left. "We are not sure if this is a miracle, a science, or what. All the thirteen Wild Boars are now out of the cave," the Thai Navy SEALs wrote on Facebook, referring to the soccer players by their team name. The final four SEALs then emerged from the cave as heroes and received widespread attention online within hours of their exit. The dangerous mission led to the death of one former Navy SEAL last week, Thai authorities said. According to BBC News, Saman Kunan, 38, lost consciousness on his way out of the Tham Luang cave complex after delivering supplies to the missing group. The two and a half mile long escape route was flooded and extremely difficult to maneuver. Rescuers had to give the boys swimming lessons and eventually made the decision to attempt what was a very long and dangerous trip through a dark, narrow cave full of floodwater.